This came out great, I am so glad you liked it! Google Reader FTW. I never really *got* it until about a year ago, and I’ve been tracking all the blogs I read (and yours!) ever since 🙂 It’s definitely insanely useful. This soup looks so tasty and hearty. Just perfect on this cold day. I love lasagna but I’ve never had it in soup version. This looks delicious! Yum! That looks and sounds delicious! I am so loving your blog. Now your newest follower and off to look more!! What a great idea… lasagne as a soup! I’m going to try this one tomorrow, my family would love this one. Btw, what is Google Reader? I’ve been going through “Read My Blogs” on WordPress to avoid having emails pile up..
Google reader is a feed reader connected through a google account. You can subscribe to any blog, and even websites. You just go to the google reader website on your computer, or they have apps for smart phones and tablets, and it let’s you know when blogs have new posts. No emails required 🙂 it’s probably like reading through WordPress, but more universal. Check it out. It’s awesome! Stefanie, I have to hand it to you. This is a first for me. 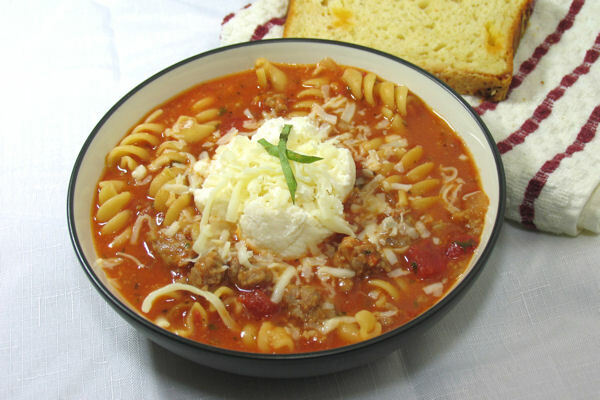 Lasagna soup? Who knew? I cannot wait to try this. It sounds like such a winner! Wow! This soup looks fantastic! I can only imagine how good it smelled while it cooked too! I’m so glad you shared this because I handn’t seen it before. Now this is my kind of soup! I never would have thought of this before – and that ricotta puts it over the top for me. Delicious! This looks so good!! I have never heard of lasagna soup before, but I’m just sure it’s amazing. This is a great idea!! with the ricotta dollop..yummy!! I love google reader..not sure why it took me so long to use it!! It sounds incredible! And absolutely delicious! What a novel idea – a nice hearty soup! This is hands down best idea ever and the beat soup ever! My husband thanks u in advance! wow…Never had I thought of this one!! My kids will get a kick out of this…and I think I’m going to like it alot!!! 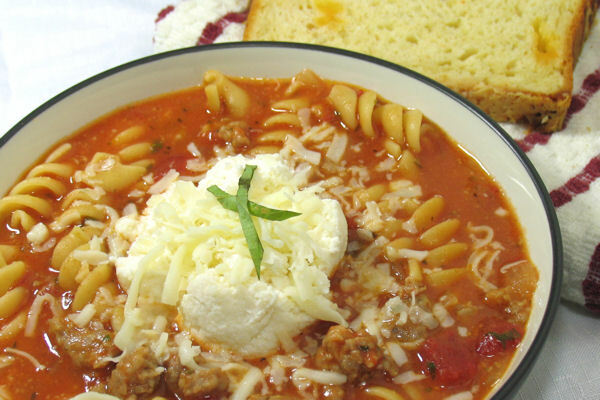 How can anyone resist something called lasagna soup? Yum.